Be patient, these are LARGE images; they will sometimes take a moment to load but WORTH IT if you want to build this. Last edited by rhgwynn; 02-25-2013 at 12:12 PM. Ah yes, the old magneto charger article. That's a nice clean copy too. Has anyone on the forum ever built it? Is anyone here educated enough to tell me how this can be built as a plug-in? Even if it requires more parts...it would be nice to not have to worry about the battery and whether or not it is charged up. How strong (amps rating) of a power supply would one need? Electric Davyboy built one I think. Robert, think about it, a lead acid car battery can put out 700-800 "Cold Cranking Amps" as the ads say. You can't get that much juice out of a wall outlet without some form of storage. You can either go with capacitor banks or with a really big, iron cored transformer. WHat's so hard about using a trickle charger and keeping the thing plugged in? I love the burn marks on the wall behind the magnetizer! Electromagnets are all about amp-turns. This thing runs off 12V at 40A, you can get exactly the same result with 120V, 4A. Just use 10x as many turns, of magnet wire with 1/10 the cross-sectional area. Obviously you have to use DC. You can plug it into the wall using a bridge rectifier. Put the switch on the AC side of the rectifier, and when you turn it off the rectifier will act as a flywheel diode to discharge the magnetic energy safely. Put the switch on the DC side if you want it to die instantly in a huge flaming arc. Large neo magnets may be a better solution nowadays if you don't mind handling them. I built Gingery's magnetizer myself a few years ago, but IMO it didn't really have quite enough oompf to get magnets completely charged even at 10A measured at 120VAC input. I was thinking about some kind of power amp for it to raise the energy going to the coils to do a better job. I used modern 150C rated coil wire, and a cap bank made of 500VDC caps (mil surplus) too. Last edited by ken; 03-05-2013 at 06:53 AM. I don't have the Gingery book. Is this a capacitor-discharge unit, or are the 500-volt capacitors used for filtering the rectified AC? I think it's a cap-discharge; which is common for a industrial magnetizer. Maybe there are two Gingery designs. I recall discussion of one that was just a big electromagnet driven by a rectifier off the AC line. If it's capacitor discharge, one problem is that the capacitor can resonate with the coil, causing field reversals, which demagnetize the magent, and will destroy the caps if they are electrolytic and not in a protective circuit. Does anybody have the book? 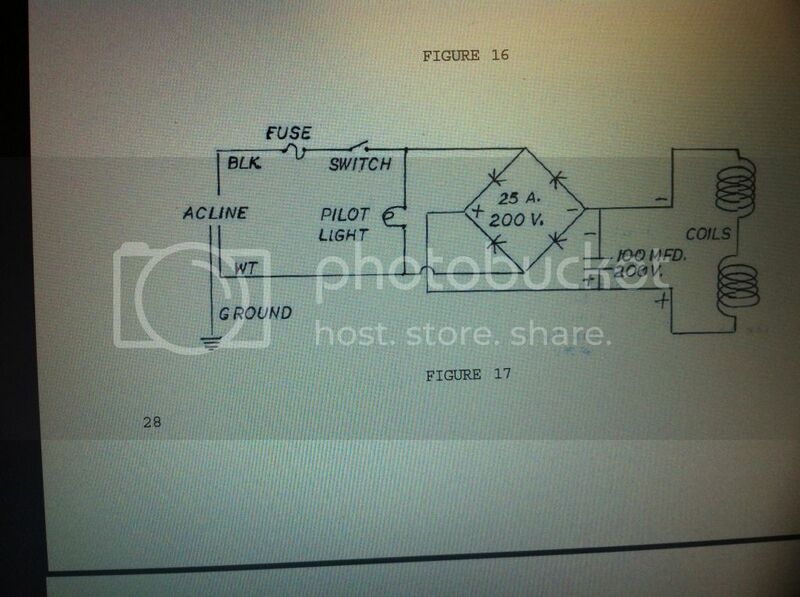 If so, if they publish a scan of the circuit from the book, I'll be able to tell. This is not a capacitor-discharge circuit. This is a simple full-wave rectifier (25 A, 200 V) with smoothing filter capacitor (100 MFD) driving a field coil (Coils) with the resulting direct current. What is the DC resistance of the coil, and how many turns of wire does it have? The intent is to compute the ampere-turns. Hi, I got directed to this forum when doing a google search for building a magneto charger, but the images aren't coming up. I've tried everything, are they no longer hosted? Anyone know where I can get this building guide from? Still, it's been fun looking round here. Nice friendly forum with some surprisingly helpful stuff. You mean posting #10, above? Just tried it. It works for me. It's a video, not a still picture. Maybe he means post #1 , the one which claims "BIG images", it's empty in my browser. FWIW I have 2 brute force speaker magnetizers, and of course they easily magnetize any kind of pickup. Thanks guys. I did indeed mean post number 1, the original post. It's completely empty in my browser (I use Google Chrome, maybe that has something to do with it). But, I have since found a link which displays all 5 pages of the device build. Should I put it up here? (never know if I'm allowed to when new to a forum). It might help stop any future newbies coming along & digging up old threads (like I just did ). Doesn't Gingery sell all his booklets on ebay? It's undoubtedly copyrighted material and TBoy may have taken it down as a result. There are plenty of photos and discussions on a forum called smokestack -whatever that is. I have since downloaded the images to my computer & printed them off for future reading (when funds & workshop facilities eventually allow me to build such a device). Wow, 20,000 Amp turns is at least 2 x more than we'd ever need for pickup magnets but as the guy says it can't hurt anything. I assume the 150 pounds is partially the car battery. If it's all iron and copper it's going to be a rather expensive item to put together. That new magnetizer design would NOT be cheap to make either. Gingery's basic design was OK, but I thought it just didn't get enough power. I wonder what would happen if I took all the rectifier stuff out of mine and hooked it up to a car battery? I plan to power mine from my workshop welder. It's around 20 volts (or so) & goes from 10 right up to 150 amps. But I also have a pretty heavy duty car battery I can use as well if the welder doesn't like magnetising. The welder is an inverter based machine (basic model for TIG & Stick welding), I have no idea what the output wave looks like though. I would guess these magnetisers prefer the flat-line DC of a battery to an non-smoothed rectified AC current. But I could also smooth out some AC if I had to, I was going to build my own welder a while back & wound 2 large smoothing chokes onto old microwave oven transformer cores. Sure I could pick up some good sized capacitors as well, if needs be. I also have an oscilloscope, maybe I should dig it out & connect the welder up, see what the output looks like. I could experiment with my home made smoothing chokes (otherwise known as reactors in welding speak, I believe) see if they actually do anything. As for cost, no it definitely wouldn't be cheap, but finding a good used magnetiser is next to impossible, especially here in the UK. If I had to I would turn the amps down slightly & increase the number of turns on each coil, meaning I could use thinner (cheaper & more readily available) wire whilst (in theory) keeping the same ampere-turns ratio, thus the same "power" (this, I believe, is where the Gingery plans differ from these plans). Not sure i this actually rings true though as more resistance is introduced with thinner wire & more length. I'm guessing multi-strand cable or flexible wire is a definite no-no here? Our household cable here in the UK is a kind of semi-flexible stuff, usually made up of just 7 cores of smaller copper (sometimes shaped to fit together more snugly) twisted & insulated. Flex of the same gauge would probably have 50-100+ separate cores twisted together (like welding cable). I understand multi-strand cables & flexes don't work well in transformer cores due to eddy-currents circulating each separate core/strand of the cable??? (Guess that leaves me looking or some hefty single strand wire). I also wonder if aluminium conductors would be cheaper as copper but just as effective (or as close as necessary)??? Last edited by nutgone; 01-02-2014 at 12:19 PM. I have built (and daily use) 2 brute force speaker magnetizers ... which of course easily magnetize any pickup, what I often do for pickup winder friends. That said , those 20000 AT promised by the above posted design are not overkill by any means. Vacuum is the worst magnetic conductor (mu=1) , same applies to "air" and , bad for us, ceramic magnets which are not far from that. You need 800000 AT/meter to guarantee saturation in a ceramic , so those 20000 AT will cover 2.5 cm= 1 inch. Remember it's not only the magnet thickness but also any space not filled with iron (or nickel). Alnico is easier, both because it *is* a magnetic metal so its own mu is reasonably good, and its coercivity (resistance to magnetization/demagnetization) is lower, but you still need roughly 1/4 of the power needed for ceramics. FWIW my "small" magnetizer does up to 105mm (~4") diameter ceramics, is single phase powered, 220V (~200V DC), some 22/25 A , so it needs around 5 KW and lives at my shop ; the "large" one lives at a friend's Factory because it needs 3 x 380V (~500V DC) at 46 A , so some 23KW , does 150/155 mm magnets (think G12H/V30) , and now I'm building a larger one for 190/220 mm magnets (think EVM15 , E130/140 , etc.) *BUT* haven't finished it yet, because I doubt a regular 3 phase 380V line will be able to power it, and the necessary BIG capacitors for a Capacitive Discharge one are both VERY expensive and not available here. I *might* import a ready made one from China, but it will cost some U$20/25K FOB (it's not opnly the Power Supply but also the magnetizing coils and yokes) and don't know how much will I have to pay, both in taxes and bribes, to get it to my door, so it's still in standby for now. I write this to show how magnetizer costs rapidly escalate out of reach once you want to go beyond the smallest ones. You pickup guys have all the luck . That's all really interesting stuff. I am primarily wanting to build a magnetiser to "re-charge" the magnets on old engine magnetos. But I also have an unhealthy (or perhaps to some healthy) obsession with free energy devices, many of which involve magnets. But from what you say I would need a pretty big machine to magnetise something like neodymium material. Still, if I keep my research small I could get away with the plans above. Anyway, it's unlikely I will be building anything very soon. Money is very tight & I have far too many other unfinished projects. But hopefully I will be sourcing parts for this machine around the summer time this year. The idea is to get a coil winding machine together as well so I can completely recondition old magnetos & bring in some extra money that way. I've been looking at cheap Chinese coil winders, but that's a whole other subject (which I expect is covered elsewhere on this forum, I'll have a look later). If you want to magnetize Rare earth magnets you will need another of order of magnitude. BIG problem with Neo and other Rare Earth magnets is that they require much *higher* than the saturation point of *any* ferrous material, so *no* iron cored magnetizer will do. They require *air* core coils which by definition do not saturate, relatively few turns, and hundreds or thousands of Amperes, (not a typo) which means Capacitive Discharge magnetizers only, and that with very good (expensive) capacitors and switchers. Expensive oil filled caps (not cheaper electrolytics) , charged at thousands of volts (think 4KV and such) are needed for such tasks. Personally I've decided to stick to ceramics for that reason for the foreseeable future. The nice thing about ceramics and Rare Earths is that they don't discharge measurably over time so you really have no need to charge them anyway.